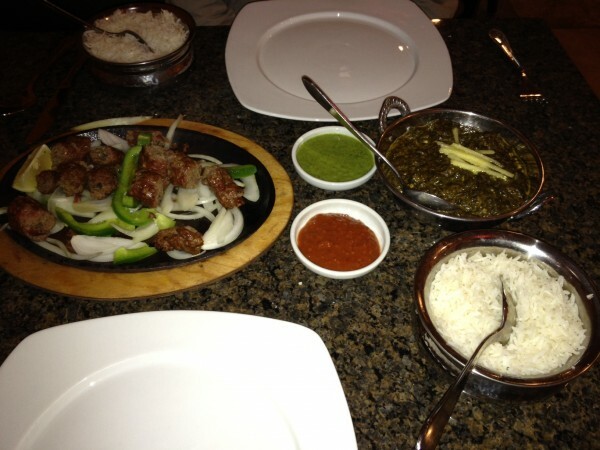 The Mughals is a new Indian restaurant that has been getting lots of love on the chow.com boards. Steve is not a fan of Indian food (or sushi, or Greek, or Mexican, for that matter) so I was happy that Chucky was willing to trek up to Burlington to try it with me. My saag paneer (spinach and cheese curry) was quite good and I enjoyed the aloo naan (potato filled bread). Chucky had the lamb shahi seekh, a minced lamb mixture that had been cooked on skewers. It was spicy and picked up a nice smokiness from the tandoori clay oven. My only complaint is that the rice seemed slightly undercooked. Our service was slow and we waited a good 20 minutes before flagging our waiter down at the end of the meal. The prices are reasonable; in line with other Indian restaurants in the city ($12-$15 for entrees). The strip mall location makes it a challenge to find (it’s behind the shell station). They have a buffet lunch that is supposed to be quite good, so consider it if you are in the area.